In a world once dominated by Japanese manufacturers, the 85cc two-stroke class has seen a major shakeup in the last decade. Technology has since evolved, with some manufacturers making huge strides, while others did nothing. Honda pulled out completely, opting to pursue a 150cc four-stroke model. All these changes and continued two-stroke technology advancements have put some European manufacturers on top of the very competitive 85cc class. The 2019 Yamaha YZ85 might look similar to last year’s model, but there are big things happening just under the surface. The suspension package is noticeably stiffer. Yamaha revamped the styling on its two-stroke model lineup back in 2015, but did almost nothing when it came to improving overall performance. That’s not necessarily a bad thing, though. The bikes all perform well and have solid sales numbers. 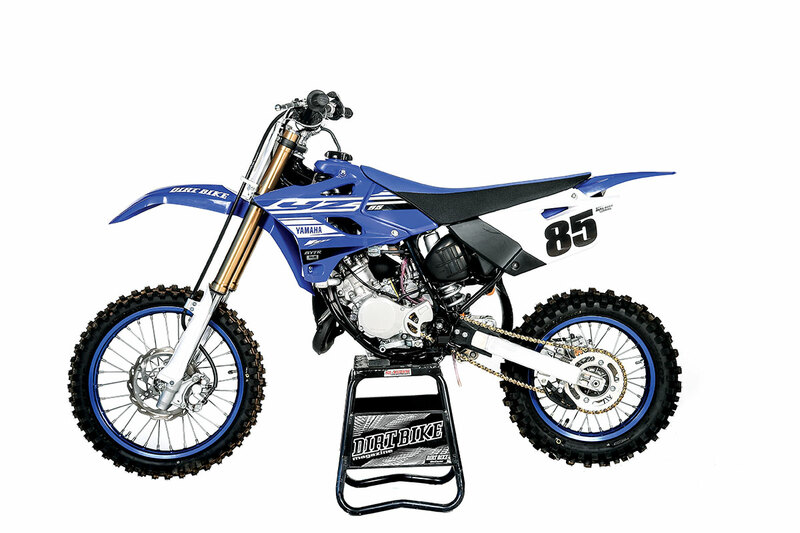 As we said before, at first glance, the 2019 YZ85 looks like it got only minor cosmetic updates, but this is definitely not the case! 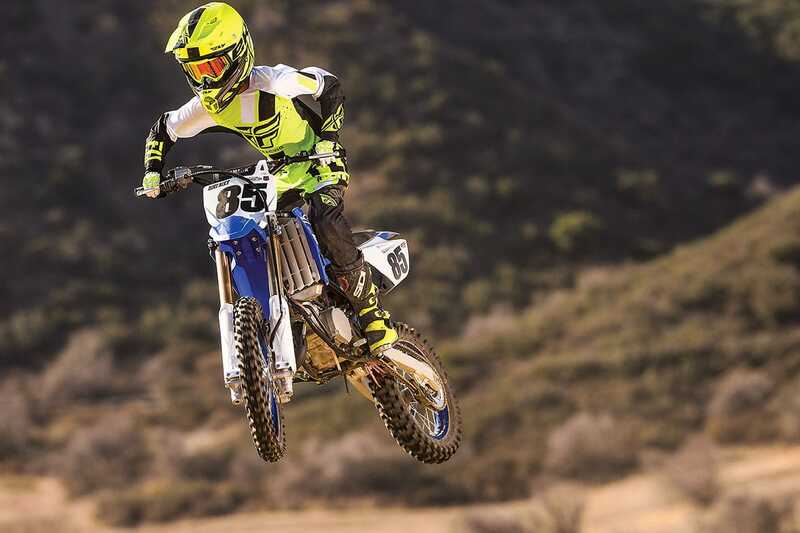 Yamaha is making a serious push towards becoming the leader in the 85cc class. 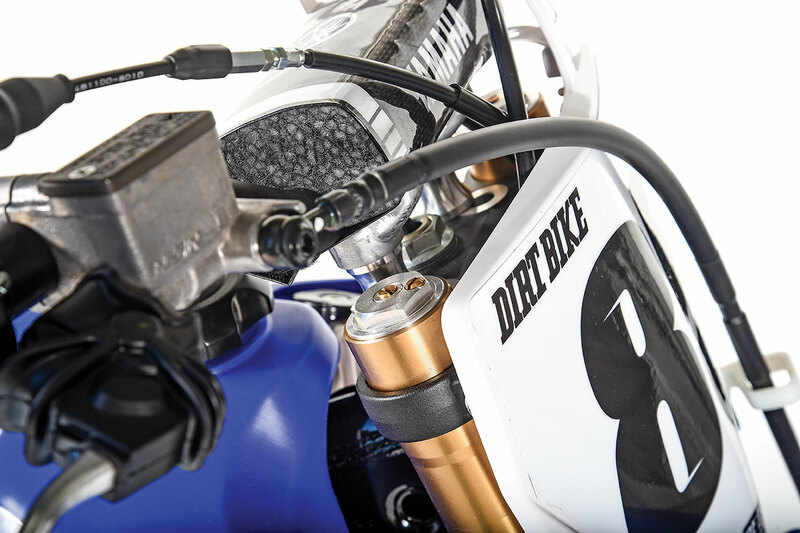 The big news for the 2019 YZ85 is all about power. The all-new, 85cc, liquid-cooled, two-stroke engine now features the Yamaha Power Valve System (YPVS) designed for broad, tractable power across the power curve without losing peak power at high rpm. Yamaha also wanted to reduce the need for frequent shifting. A new cylinder head and longer connecting rod design increase compression. A new crankcase design features a spacer-style reed valve intake, and the 28mm Keihin flat-slide carburetor returns but is attached to a high-flow airbox and intake boot. In the lower end of the engine, Yamaha revised the transmission, increasing the width of selected gears to improve shifting ease and engagement. 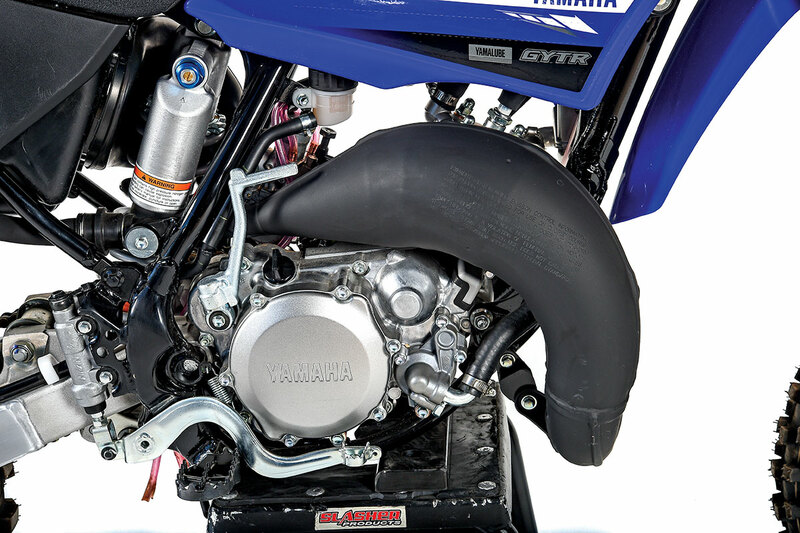 The exhaust system looks similar to that of previous years, but Yamaha has changed that as well to match the all-new engine. All the changes are designed to improve power delivery throughout the power curve, but especially in the low and midrange. The YZ85 cooling system also got some upgrades via a new radiator that has large cores and louvers. The water pump now has a cast-aluminum impeller instead of the plastic of years past. Adjustability is key, and the new four-position bar mount is perfect for growing riders. The chassis also received substantial changes. A new Kayaba 36mm inverted cartridge fork setup features 10.8 inches of travel and offers compression and rebound damping adjustability with low-friction outer tubes and internals. Lower fork guards are also new, providing more protection and updated styling. More big news up front is an all-new, four-position-adjustable handlebar mount and taper-style handlebars, allowing riders to fine -tune handlebar position to suit their size and preference. 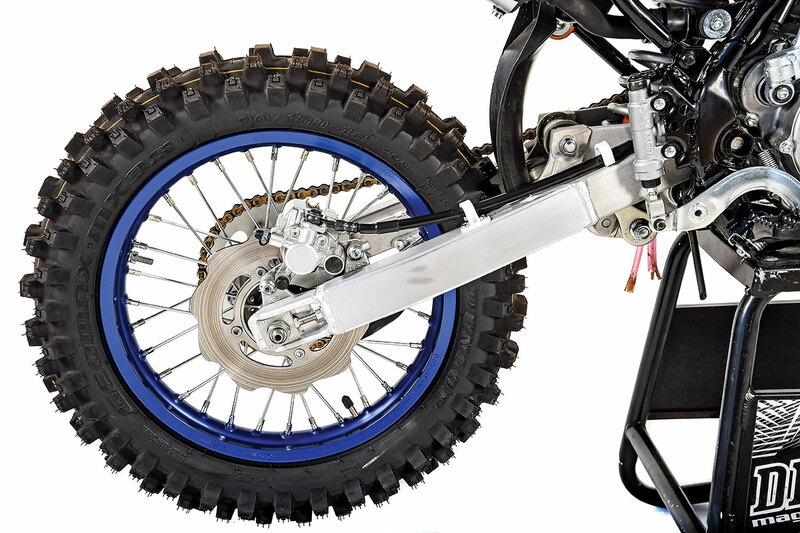 In the rear, Yamaha updated the Kayaba shock settings to match the new fork, and the redesigned swingarm that features a new composite chainguide and chain adjusters. Braking on the YZ85 got some upgrades, with new self-cleaning, wave-style rotors and a new front brake line designed to improve feel. 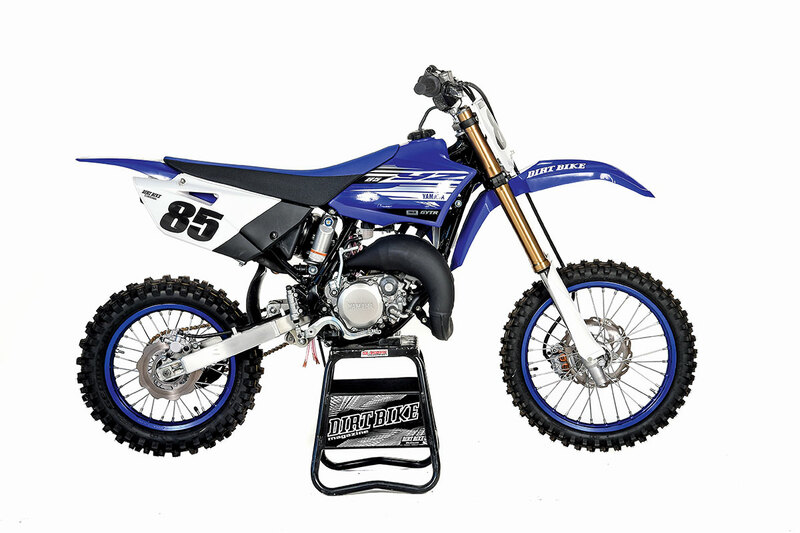 The 2019 YZ85 also has a removable subframe, gripper seat, Dunlop MX3S tires and aggressive, race-inspired styling just like larger bikes in Yamaha’s two-stroke lineup. The all-new Yamaha Power Valve System-equipped engine makes smooth, easy-to-use power, and more of it than previous models. What everyone wants to know is, is the Yamaha faster than the KTM and Husqvarna? Without doing a head-to-head comparison, it’s way too close to tell. 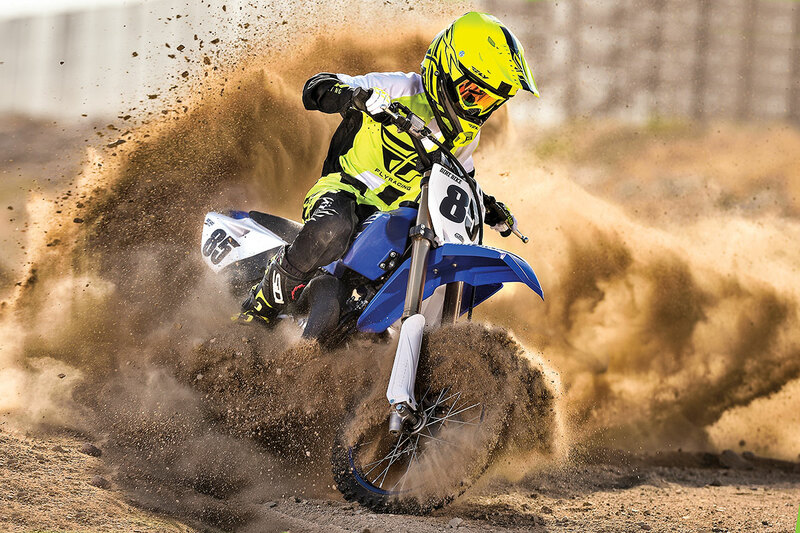 The 2019 YZ85 YPVS-equipped engine makes more power just about everywhere compared to the 2018 model, and it is way smoother, making it easier to manage for riders of all skill levels. All the test riders agreed that they didn’t have to fan the clutch to get it going like they did with last year’s bike, and they could use second gear more, because shifting down to first for more pop out of the hole wasn’t necessary anymore. Test rider Storm Hawks was all smiles after riding the 2019 Yamaha YZ85. Overall, the handling has been improved. It’s stiffer on both ends than last year’s model, and this lets the bike stay up higher in the stroke without blowing through to the bottom. Our test riders commented that this gave them more confidence when doing bigger jumps and trying to go faster. All the test riders ran slightly more sag on the 2019 than on last year’s model. If it rides too high in the back, riders complain of getting head-shake on fast straightaways. The new adjustable top triple clamp is a huge hit with everyone. Adjustability for this rider demographic is key, because it allows the bike to grow when the rider grows without Mom and Dad having to spend insane amounts of money. 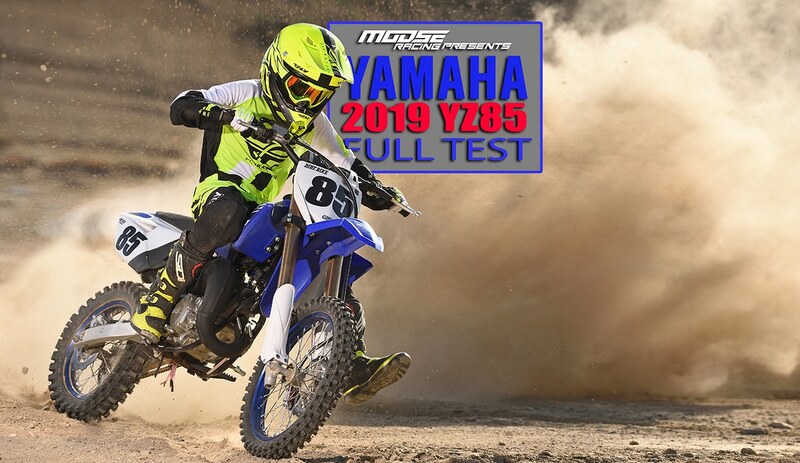 Overall, the 2019 Yamaha YZ85 has improvements across the board, and it will be more than competitive in any level of the 85cc class.